Since 1971, during the academic year the Waynesburg Lions Club, with the help of the WCHS faculty, recognizes 2 senior students each month based on the following criteria: academic standing, community service, school activities, character and sense of responsibility, performance (past & present). These students and their parents are invited to a club dinner meeting and given a certificate and dictionary. From these 18 students, two are selected to be Students of the Year and at graduation are each awarded $1000 scholarship. The WCHS Lions Club Students of the Month for March are Selena Phillips and Evan Zimmer. Selena is the daughter of Jim and Paulette Phillips of Spraggs. She has earned a 4.0 GPA throughout her high school career. Selena has been very busy at WCHS. Selena is in the Art Club, Spanish Club, NHS, and the choir. She has served as the secretary for both the choir and NHS. Ms. Phillips has also had a very successful athletic career in high school. She is a multi-year letterman and captain of the rifle team and softball team. She led her rifle team to a third place finish in the state tournament in 2019. In individual competition, she is a two-time WPIAL rifle champion, and has finished 12th and 13th in the state competition. She has also been honored as the Observer-Reporter Athlete of the week and MVP during last rifle season. Outside of school Selena stays very busy in the community. She attends a Methodist church where she serves funeral dinners and helps to lead the youth group. She has also been their Bible School music instructor for the past four years. Selena’s future plans are to attend Morehead State University and pursue a career in petroleum engineering. Evan Zimmer is the son of Andrew and Julee Zimmer of Waynesburg. He has carried a 3.8 GPA into his senior year. Evan’s time at WCHS has been spent studying business and baseball. Evan is a member of Future Business Leaders of America. He is a two-time state qualifier in FBLA competitions. He intends to obtain a business degree from West Virginia University after graduation. Mr. Zimmer is also an excellent athlete. He is a three year baseball letterman, and one year cross country letterman. Outside of school, Evan is a member of the Oakview Methodist Church. He enjoys traveling with his family and fishing. Amira Hudak and Lila Perroots. The WCHS Lions Club Students of the Month for February are Amira Hudak and Lila Perroots. Amira is the daughter of Nathaniel and Amy Hudak of Waynesburg. She has carried a 4.0 GPA into her senior year. Amira participates as a member of the Waynesburg High School Choir. During her time at WCHS she has earned an academic excellence award and a perfect attendance award. In the summers she works as a filing assistant. Amira has a love of computers and has interests in computer programming. She intends to turn this passion into a career. Her future plans are to attend college and earn a degree in computer science. Lila Perroots is the daughter of Rose and John Perroots of Mt. Morris. She has earned a 4.0 GPA throughout her high school career. Lila has stayed very busy during her stay at WCHS. She has been a member of NHS, Student Council, the Drama Club, the Choir, the Prom Committee, and the Ski Club. Lila has earned an award for academic excellence, the Joe Ayersman American History Award, was selected the outstanding Junior Choir Member. Outside of school Lila participates in 4H. She loves working with animals. She enjoys showing her livestock and being actively involved in the agriculture industry. Lila indents to pursue a career involving her passion for animals. Her future plans are to attend West Virginia University and major in Animal and Nutritional Sciences on her way to a degree in veterinary medicine. The WCHS Lions Club Students of the Month for January are Hannah Buttermore and Kristen Black. Hannah Buttermore resides in Sycamore, PA and has earned a 3.4 GPA through her high school career. She is very active in high school clubs. Hannah is a member of the Alpha club, Stage Crew, Creative Writing Club, Prom Committee, Office work, the Drama Club and she serves as the Treasurer of the Senior Class. Hannah excels at math and writing. She has earned high school awards in algebra and English, and has earned two Merit awards for her writing. Outside of school Hannah stays very busy. She has three part-time jobs at Bob Evans, Sweetfrog, and as a babysitter. In her free time Hannah volunteers at the Mapleshire Nursing Home, and cleans for the Redeemed Baptist Church. Hannah’s future plans are to attend college and earn a degree. Kristen Black is the daughter of Michael and Tricia Black of Waynesburg. She has carried a 4.0 GPA into her senior year. At WCHS Kristen is a member of the Drama Club, Marching and Concert Bands, Chamber Choir, NHS, Elementary Tutoring, Spanish Club, Flute Ensemble, and serves as the president of Student Council. Kristen loves music and has made it a huge part of her life. She has earned a varsity letter in both band and choir, and has attended both the IUP and WVU honors choirs. In the summer Kristen has worked as a day camp counselor at the Lions Club Park. Kristen’s future plans are to attend Indiana University of Pennsylvania and major in pre-dental with a minor in theatre. Jack Church is the son of Dan and Gina Church of Waynesburg. He has carried a 4.0 GPA into his senior year. Jack is involved in the Ski Club and Future Business Leaders of America. He has also worked hard as a member of the WCHS Soccer Team. Jack has been awarded as a four-year letterman in soccer. His teams have won the section three years. He has also been honored twice as an all-section soccer athlete and three times all-county. Jack has made soccer a huge part of his life. Outside of school Jack plays on the Victory Express Soccer Team and has served as a coach for Greene County Youth Soccer Camp. Mr. Church is a member of the Waynesburg First Presbyterian church where he attends their Youth Ministry. Jack also has worked jobs at Hunting Hills, Greene County Youth Soccer, and volunteered at Mission Ex Camp. Jack’s future plans are to attend a four year university and major in pre-medicine. Madison Brooks is the daughter of Carl and Valerie Brooks of Waynesburg. Madison has earned a 4.0 GPA throughout her high school career. At WCHS she is a member of the National Honor Society, Alpha/Beta, Varsity Club, Art Club, Spanish Club and has served as the President of the Fellowship of Christian Athletes. She has been honored as a member of the Prom Court, Cinderella Ball Court, and is the 2018 Homecoming Queen. Miss Brooks has a passion for Track and Field. She has been a three year letterman and MVP. She placed third in the WPIALs, and 8th in the state last season in the shot put. Madison has been recognized as an all-county athlete for her success. Outside of school Madison volunteers at Waynesburg First Baptist children’s church. She is a member there and attends the youth group. She has also worked with children as an employee of Miss Tonette’s preschool. Madison’s future plans are to attend Clarion University to major in early childhood education and continue her track and field career. Lauren Mason is the daughter of Doug and Sara Mason of Waynesburg. She has carried a 4.0 GPA into her senior year. Lauren is an active member of the Marching and Concert Bands, the Chamber Choir, Spanish Club, NHS, the Art Club, and the Flute Ensemble. She has been recognized at the county level for her talents in band and choir. She has also been honored as a member of PMEA District band for flute. Lauren has made music a huge part of her life, and enjoys teaching herself to play new instruments. She can play the flute, ukulele, guitar, and piano. Lauren attends the Mount Morris Gospel Tabernacle. Her future plans are to attend a college or university and obtain a bachelor’s degree in chemistry. And, of course, continue playing music. Caleb Blair is the son of Heidi and Matt Blair of Waynesburg. He has earned a 4.0 GPA throughout his high school career. Caleb has been recognized as a wrestling letterman, 4-year soccer letterman. He has served as a captain of the soccer team, and was selected to the all-county soccer team. At WCHS, he has participated as a member of the Youth Alive Club, and the Future Business Leaders of America. Caleb was a regional champion as a competitor on the high school FBLA team. Outside of school Caleb works as a youth soccer referee, and as a farm laborer. He also competes as a member of Victory Express Soccer Club. Caleb is also a member of the First Presbyterian Church of Waynesburg, and attends Crossroads Youth Ministries. His future plans are to attend a university and earn a degree in biomedical engineering. Rachel Calvario and Daniel Layton. Rachel Calvario is the daughter of Dave and Beth Calverio of Waynesburg. She has carried a 4.0 GPA into her senior year. Rachel is a member of the National Honor Society, The Concert and Marching Bands, Student Council, the Academic League Team, and has competed on KDKA’s Hometown High Q team. She has earned several high school academic awards and the Leo Club Gold Seal for community Service. Rachel is a member of the First Presbyterian Church of Waynesburg, where she attends Crossroads Youth Ministries and is a leader of the children’s ministries. She has also attended several international and domestic missions’ trips through her work with the church. In her free time Rachel Dances at InMotion Dance and Fitness and works in the summers as a Counselor for Greene County Day Camp. Rachel’s future plans are to attend a four year university and major in biology. She intends to study medicine or biological research. Daniel Layton is the son of Rick and Andrea Layton of Waynesburg. He has earned a 4.0 GPA throughout his high school career. Daniel is a member of NHS, Student Council, the Ski Club, the Spanish Club, Yearbook Club, Drama Club, Physics Club, and Tech Crew. He has earned a varsity letter as a member of the track and field, cross country, and soccer teams. Daniel has won academic awards in chemistry, social studies, and science. He was awarded as the 2018 Herald Standard Most Outstanding AA Track Performer, and the 2018 Observer Reporter Track and Field MVP. Outside of school Daniel has worked Guest Relations for Alpha Aquatic Center and as a laborer for Layton Construction. Daniel attends the First Presbyterian Church of Waynesburg. He has also volunteered many hours for the Relay for Life and other school related charities. Daniel’s future plans are to attend a university and major in Genetic Engineering. Sarah Calvert and Caleb Stephenson. Sarah Calvert is the daughter of Judy and Richard Calvert of Waynesburg. She has carried a 3.75 GPA into her senior year. Sarah is a member of the cross country team, the choir, the Spanish Club and the Alpha/Beta Club. She has served as a member of student council and as a class officer. Sarah is a very active member of the FFA. She is the current president of the Waynesburg FFA. Sarah is also the drum major that leads the marching band. Outside of school Sarah is a member of 4H, the Upward Bound Program, and the Fairall UM Church where she serves as a Lay Speaker. She also works part-time as a gardener and farmhand. Her future plans are to attend a major university (WVU or PSU) and major in Agricultural Education and Music Education. Sarah would like to encourage everyone to make the most of their opportunities. Caleb Stephenson is the son of Bob and Kristi Stephenson of Waynesburg. He has worked to maintain a 4.0 GPA throughout high school. Caleb is a two-year football and wrestling letterman. He also participates in Youth Alive and Future Business Leaders of America. Outside of school Caleb is a member of Crossroads Youth Ministry and attends the First Church of the Nazarene. In his free time Caleb enjoys hunting and fishing. He also keeps a job doing lawn care. In the future Caleb plans to attend a four year college and obtain an accounting degree. He would like to work as a CPA. Caleb would like to thank God and his parents for the talents and abilities he possesses. Myles Cramer and William Behm have been selected as LIONS Club Students of the Year from Central Greene. They were selected by the faculty at WCHS. Myles Cramer is the son of Mark and Melissa Cramer of Waynesburg. He finished his high school career with a 4.0 GPA. Myles is a member of the Marching and Concert Bands, Jazz Ensemble, NHS, Student Council, Academic League and the Stage Crew. He has served as the Drum Major for the marching band, and as president for the National Honor Society, Student Council and Senior Class. Myles’s future plans are to attend a four year college and major in computer science and mathematics. He plans to one day work for the FBI. William Behm is the son of Jennifer and Clay Behm of Waynesburg. He finished his high school career with a 4.0 GPA. He is a member of Student Council, the Academic League Team, Spanish Club, Ski Club, Creative Writing Club, and the Envirothon Team. Will has served as Captain of the Soccer team. He is also a 4 year letterman in soccer and track. During the spring of 2017, Will placed 3rd in the WPIAL and 9th in the state for pole vault. This year he was the WPIAL pole vault champion. He was nominated to the All-County track and field team. In his spare time Will plays the guitar at local community event and festivals and works as a lifeguard and soccer referee. Will’s future plans are to attend Middlebury College in Vermont and study biochemistry or molecular biology. He also plans to vault there. May - Claire Garber and Mara Negley. Claire Garber is the daughter of John and Lisa Garber of Waynesburg. She has carried a 3.9 GPA into her senior year. In school Claire is a member of Youth Alive, Spanish Club, Varsity Club, NHS, Alpha/Beta, and the Fellowship of Christian Athletes. Claire has played varsity basketball for 4 seasons, and varsity soccer for 4 seasons. She was a member of the WPIAL champion girls soccer team in 2017. She was selected as an all-county soccer athlete this year, and all-county basketball athlete last year. Outside of school Ms. Garber participates in youth group and gardening. She has held jobs at Subway and babysitting. Ms. Garber plans to attend W&J college and major in Art and Business. She wants to pursue a career in interior design. She will also be playing soccer for W&J. Mara Negley is the daughter of Jennifer Lemley and Christopher Negley. She has carried a 3.65 GPA into her senior year. In school Mara is a member of the Prom Committee, Alpha/Beta Club, French Club, National Honor Society, HOSA and the Varsity Club. This past year she participated in cross country. She has also lettered in Marching/Concert band. Mara has earned her OSHA and CPR certifications. Outside of school Ms. Negley serves as a volunteer firefighter for the Mount Morris Volunteer Fire Department. In her spare time Mara enjoys caring for animals and working on cars. She also works as a babysitter. Mara’s future plans are to attend Penn State Fayette Campus and major in nursing. The Lions Club Students of the Month from Waynesburg Central for April are Johnna Calvert and Emma Rudash. Johnna Calvert has carried a 3.56 GPA into her senior year. Outside the classroom Johnna has stayed very busy at WCHS. She is a member of the Chorus, Envirothon Team, Green Team and FFA. She has made the FFA a huge part of her life. She has been recognized as an outstanding member for the past three years. Ms. Calvert was also recognized at the state level with the FFA Keystone degree. Last year she received the Rachel Carson healthy planet award. Johnna is also very active in the community as well. She is a member of 4H, and the local United Methodist church. She raises rabbits on her farm, and is a member of the American Rabbit Breeders Association and specializes in New Zealand rabbits. Ms. Calvert intends to attend Penn State and earn a degree in animal science. Emma Rudash has carried a 3.95 GPA into her senior year. In the school she has been a member of the Alpha/Beta club, National Honor Society, Art Club president, Yearbook Staff, and Youth Alive. Ms. Rudash spends a great deal of her time volunteering. She has volunteered for Hospice by making cards and memory boards. She has participated in their holiday services, and spent time visiting patients. She is also very active in her church, the Mount Morris Gospel Tabernacle. Ms. Rudash has attended mission trips. She has spent a lot of time with children through church groups. Emma has volunteered in Vacation Bible School, children’s church, youth group, and has helped with Girls Impact. She was honored as a twelve year program for the gold medal of achievement through the Girls Impact Program. Emma has worked in the summer at the Rising Creek Bakery. Emma plans to attend the Pennsylvania College of Art and Design and major in graphic design. Elle is the daughter of Debby and Ron Hampson of Waynesburg. She has carried a 3.9 GPA into her senior year. Elle has served as a captain of the basketball team where she has been a 3 year letterman, and has been recognized as a Herald Standard Winter Sport Athlete. She also served as a captain of the WPIAL champion girls soccer team. She was a 4-time letterman and was selected to the All-County team. Elle also referees soccer games for youth teams. Elle is a member of the First Baptist Church and attends Crossroads Youth Ministry. Ms. Hampson plans to attend the University of Charleston and major in International Business. Olivia King is the daughter of Gary and Shalene King of Waynesburg. Olivia has carried a 4.0 GPA into her senior year. She has been a member of Alpha/Beta, the LEO club, SADD, NHS, the ski team, FBLA, Student Council, and the Varsity Club. Olivia is also the captain of the cheerleading squad. Ms. King has also been selected to the prom court, homecoming court, Cinderella ball court, and represented Central Greene as the 2017 Miss Merry Christmas. Outside of school Ms. King enjoys the outdoors. She hunts, fishes and, skis. She has also worked at City Mission Hidden Treasures and as a dance instructor at Inmotion. Olivia has been awarded the Leo Club 100 hours award. Her future plans are to attend Penn State University and major in Early Childhood Education. The Waynesburg Central High School Lions Club Students of the Month for February are Ms. Destiny Withrow and Kaylin Tretinik. Destiny is the daughter of Shirley Martin and Lee Shriver of Waynesburg. She has carried a 3.98 GPA into her senior year. Destiny is a member of Physics Club (Vice President) Spanish Club, Theatre Tech Club, Alpha-Beta Club, Student Council, and National Honor Society. She excels in math and science where she has earned highest honors for the past two years. Destiny is also a volleyball letterman. Destiny’s future plans are to attend Slippery Rock University and pursue a degree in secondary education. She wants to teach physics. Kaylin Tretinik is the daughter of Shauna and Paul Tretinik of Prosperity. She has carried a 3.88 GPA into her senior year. Kaylin is a member of Alpha Beta Club (President), Ski Club (Vice President), National Honor Society, Prom Commitee, Yearbook, Drama Club, & Art Club. She has worked as a stage manager at the high school. She is also the captain of the cheerleading squad and a two-year letterman. Kaylin attends the Pitt Gas Missionary Church and the Jefferson Baptist Church Youth Group. She has served with the Baptist Church Youth Group on several mission trips to the Dominican Republic. Kaylin plans to attend Slippery Rock University and major in Early Childhood Education & Special Education. Briana Brock is the daughter of Chad and Rebecca Brock of Mount Morris. She has carried a 3.95 GPA into her senior year. Briana is a member of the National Honor Society, the Future Business Leaders of America and the Leo Club. She has served as the secretary of the senior class and is a cross country letterman. Outside the classroom Briana works full-time as a manager at 5 Below. Her future plans are to attend Chatham University and major in nursing. Gabrielle Stewart is the daughter of Stacey Courtwright of Waynesburg and John Stewart of Rivesville, WV. Gabrielle has carried a 4.0 GPA into her senior year and is ranked 1st in her graduating class. She is a member of the National Honor Society, Leo Club and Student Council. She is also a four year letterman on the cheerleading squad. Outside the classroom Ms. Stewart works part-time at Giant Eagle and has worked in the summers as a Day Camp counselor. She also attends South Hills Bible Chapel. Gabby plans to earn a pre-med degree and pursue a career in anesthesiology. 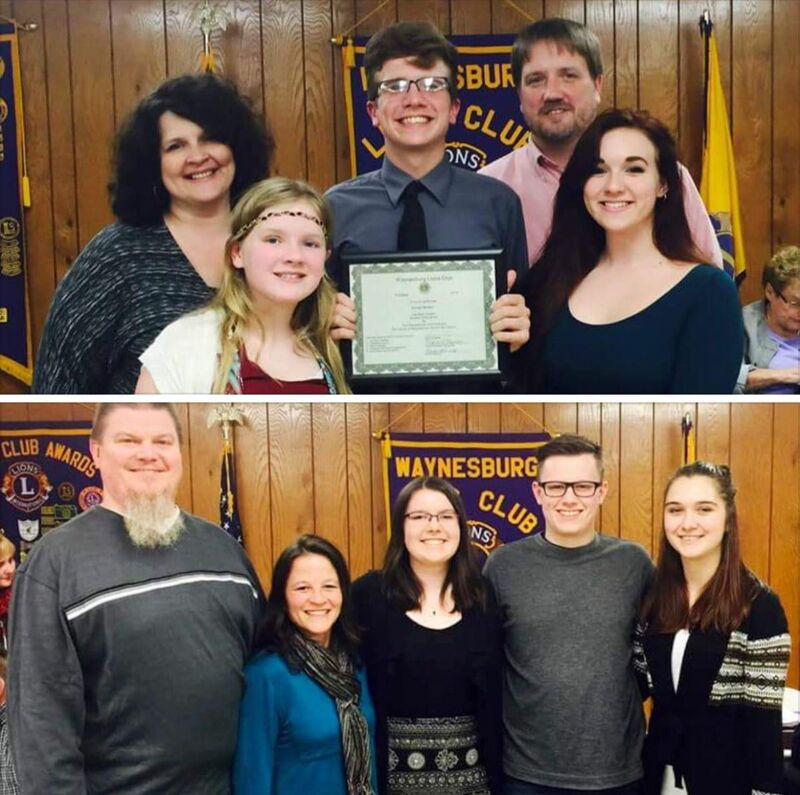 The Lions club students of the Month from Waynesburg Central HS for December are Shay Echegaray and Cole Leathers. They were selected by the faculty and will be recognized at the Lions Club Monthly Dinner. Shay Echegaray is the daughter of Tracy and Ronald Echegaray of Waynesburg. Shay has carried a 4.0 GPA into her senior year. Shay is a member of the National Honor Society, and the basketball and track and field teams. Shay has been a captain of the basketball team, and was the team MVP during her junior year of track and field. She has also served as the president of the physics club. Outside the classroom, Shay is a member of the Oakview Methodist church and the Crossroads Youth ministry program. She is also a certified lifeguard and works summers at the Alpha Aquatic Center. During her free time, Shay enjoys creating art, and singing. Ms. Echegaray’s future plans are to attend a four year university and major in engineering. Cole Leathers is the son of Lynn and Greg Leathers of Waynesburg. He has carried a 4.0 GPA into his senior year. Cole is a member of the Ski Club, Drama Club, Spanish Club, Student Council, and the National Honor Society. Cole is also a two year track and field letterman. Outside of the classroom, Cole has been a member of Boy Scouts, and has earned the rank of Life Scout. He has also worked as a summer day camp counselor, and summer softball site director. He also spends a lot of time playing the guitar. Cole is a professional musician. Cole’s future plans are to major in political science and pursue a career in law. The Lions Club Students of the Month for November from Waynesburg Central HS are Darton McIntire and Alexis Fuqua. They were selected by the faculty. Alexis Fuqua is a daughter of Curtis Fuqua of Washington and Heather and Lee Sorrow of Waynesburg. Alexis has carried a 3.99 GPA into her senior year. She has been a member of the Varsity Club, NHS, Penn Serve, SADD, Leo Club, Young Voters, Prom Committee, and has served as the president of the Spanish Club. Alexis has also been a 3 year softball letterman, and co-captain. Outside of school Alexis has worked at Subway, the Coach’s Café, and served for the Women’s Auxillary of South Franklin VFD. She has also worked in sales for the Washington Wild Things, and as a hostess at Denny’s. Ms. Fuqua’s future plans are to attend Youngstown State University and major in dental hygiene. Darton McIntire is the son of Steve McIntire and Tonya Haught. Darton has carried a 4.0 GPA into his senior year. Mr. McIntire has made faith and basketball a huge part of his life. He has been the president of the Fellowship of Christian Athletes, and Youth Alive. Darton has also been on Student Council and the National Honor Society. Outside the classroom Darton is an all-section basketball player. He was the 2015-16 Greene County player of the year, and third team all-state. Outside of school, Darton has worked as a trainer for High Calling Hoops where he shared basketball fundamentals and Christian values with young kids. Myles Cramer and William Behm have been selected as October’s LIONS Club Students of the Month from Central Greene. They were selected by the faculty at WCHS and will be honored at the LIONS Club monthly dinner. Myles Cramer is the son of Mark and Melissa Cramer of Waynesburg. He has carried a 4.0 GPA into his senior year. Myles is a member of the Marching and Concert Bands, Jazz Ensemble, NHS, Student Council, Academic League and the Stage Crew. He has served as the Drum Major for the marching band, and as president for the National Honor Society, Student Council and Senior Class. William Behm is the son of Jennifer and Clay Behm of Waynesburg. He has carried a 4.0 GPA into his senior year. He is a member of Student Council, the Academic League Team, Spanish Club, Ski Club, Creative Writing Club, and the Envirothon Team. Will has served as Captain of the Soccer team. He is also a 4 year letterman in soccer and track. During the spring of 2017, Will placed 3rd in the WPIAL and 9th in the state for pole vault. He was nominated to the All-County track and field team. Brittany Rhodes and Madison Church have been selected as Lions Club Students of the Month for September. They were selected by the faculty of WCHS and will be guests of honor at the monthly Lions Club dinner. Brittany Rhodes is the daughter of Robert and Angela Rhodes of Waynesburg. She has carried a 4.0 GPA into her senior year. Brittany has been a member of the National Honor Society, Leo Club, Spanish Club, Principal’s Council, Alpha-Beta, Ski Club, Young Voters Club, Prom Committee and Penn Serve while at WCHS. She is a member of the competition dance team at Inmotion Dance and Fitness. She is a member of the Fairall United Methodist Church. Brittany was also the runner up at the 2016 Miss Rain Day pageant. In her spare time Miss Rhodes enjoys watching baseball with her father and collecting Elvis Presley records. Her future plans are to attend the University of Kentucky and major in either Political Science or Prelaw. Madison Church is the daughter of Bill and Chrissy Church of Waynesburg. She has carried a 4.0 GPA into her senior year. Madison has been a member of the SADD team, Leo Club, Varsity club, National Honor Society, Spanish Club, Student Council and has played on the varsity volleyball and softball teams. Miss Church was the 2016 recipient of the Bausch + Lomb Honorary Science Award. Madison has worked summers as a day camp counselor. She also is a member of the Youth group, and Praise team at the Jefferson Baptist Church. She has also attended mission trips through her work in the church. Her future plans are to attend East Carolina University and major in criminal justice. She also intends to join the ROTC and enlist in the National Guard. Congratulations to Jeromy Mackey and Sarah Bish!